This cake blows me away. It looks like something you’d see at a wax museum. Almost a waste to eat it. Well, some good news on that front. Artisan Kelly provided instructions on where to properly decapitate Spider-Man through the fondant so that the recipient–five-year-old James–could “keep the head as a memento.” Heh. 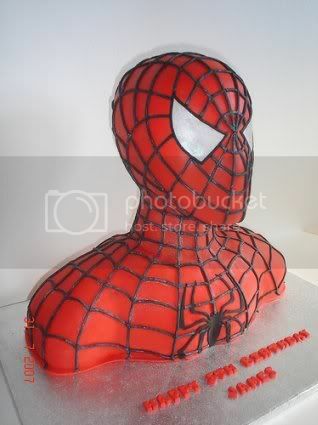 Looking for instructions for making a 3D Spiderman bust cake? Or any bust cake? I recommend checking out Cake Sculpture & Sculptured Figure Piping, a classic book from a cake-maker famous for his cake sculptures of celebrities. Kelly created the cake for James’s fifth birthday through her business Crafty Confections in Ireland. She went with a chocolate-flavored cake filled with IMBC, which I’ve learned is shorthand for “Italian meringue buttercream” in cake-making parlance. The afore-mentioned head started as a ploystyrene female mannequin head that Kelly had to “build up” to the shape of Spider-Man’s head. The body and shoulders are carved out of a 10″ and an 8″ cake and I made the webbing using a sugarcarft gun – it took 2-3 hours just to make and apply those! Thanks to Kelly for sharing the photo and the deets. Click on the pic above to see her portfolio on Flickr. I WANT TO EAT SPIDERMAN’S FACE!!! Wow – fantastic cake this time. However, I have to complain again, as the polystyrene head piece really makes me angry. The cake’s innards should be 100% edible, or else what’s the point? Clearly this isn’t as bad as last week’s action figure, or that styrofoam alien cake, but c’mon cake people, really. I say if your mom can make it all-cake, they can too. I liked the action figure… as long as the ‘artificial’ element isn’t structurally critical to the cake, I don’t mind it. On another note, I’m concerned that any of the cakes would anger you. Have your mom make another cake, I will not be angered. As for these other cakes, you’re probably right. That cake is amazing. But I wonder about why someone would want to take a big cakey bite out of Spiderman’s shoulder. SH, my Mom will be pleased to hear she has such an ardent fan. Perhaps the next time she has eight free hours to rub together, I’ll have her make a GWS cake. Anyway, as we get closer to that time, I’ll take suggestions for her next ‘subject’. I THINK THIS CAKE IS AWESOME. IF YOU CAN USE A FAKE HEAD. WHY NOT? SHE DID A WONDERFUL JOB. I AM SPEECHLESS. Yes we do have the head still and it has pride of place in James’s bedroom on his shelf, the cake was stunning but once cut only lasted about ten minutes as it was blinkin gorgeous. Kelly has made a couple of figures from icing for James as well, she is a true artist. James now asks for icing figures for presents and he loves to eat them, his freinds think he is sooo cool. this cake is awesome. hey you critics sometimes you can’t make it all out of cake to get the effect you want. if it was all cake and didn’t look as perfect then you would have critisized it too.